Troop 33 has served the youth of DeKalb County since 1925. We are sponsored by First Lutheran Church in DeKalb. Troop 33 was originally chartered as "Troop 3" to the First Luthern Church in May of 1925 in DeKalb County Council. Our first Scoutmaster was Erwin Charles Osenberg. In 1928 DeKalb County Council underwent a merger and became Chief Shabbona Council and our number was changed from "Troop 3" to "Troop 33". In the new Chief Shabbona Council there was another Troop 3 with an older charter. Back then they didn't allow two troops to have the same number within the same council. The older troop allowed to remain Troop 3, while we were required to change our troop to a new number. The boys were really unhappy about it, they didn't want to remove the 3 from their Scout shirts. There was an old coffee can they used for keeping extra 3's to give new Scouts when they joined. It was decided to use those 3's as another 3 to add to their uniform shirts thus going from being Troop 3 to becoming Troop 33. That's how we became Troop 33. Our council has merged several times since, but they now allow troops within a council to have similar numbers. We've proudly retained our number as Troop 33 since changing it in 1928. DeKalb County Council merged with the area of St Charles, Batavia, Elbun to become Chief Shabbona Council in 1928. Chief Shabbona Council merged with Kedeka Area Council to become Two Rivers Council. In 1972 Two Rivers merged with Fox Valley Council but retained the name Two Rivers. For a short time in 1992 our council was temporarily known as Two Rivers-DuPage Area Council. 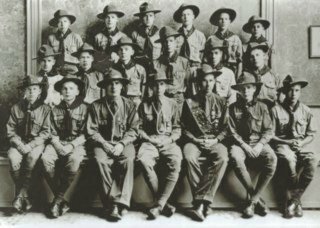 A group photo of Troop 33 from 1935. Throughout the years Troop 33 has been a spirited group of boys with an active outdoor program of activities. Our current troop slogan is "Always an Adventure". Although not always our official slogan, it's always been true. Troop 33 Scouts have hiked hundreds of miles of trails at Philmont Scout Ranch and attended National and World Scout Jamborees. From local weekend campouts to long distance tours, our Scouts have enjoyed many adventures together. Troop 33 Scouts have also been dedicated to service, helping at major disasters including floods, tornadoes, and hurricanes. Please keep in mind that this history represents the story of flesh and blood boys, hundreds of them down through the years. These boys, some now dead, some elderly, and some in the prime of youth, all began as boys eager to experience the adventure of Scouting. Despite generations of time separating them, they shared the experience of being a Boy Scout in Troop 33; memories of camping in the woods, the sweet scent of woodsmoke from a campfire swirling about them as they laughed with their friends, cool crisp nights, sun-drenched summer days, getting dirty exploring everything around them, sharing in work, fun, and all the wonders of growing up. Please explore our history. Our history is represented in the links below. Each decade history includes information about the USA during that time period to act as a backdrop. Some Other Interesting Links on the History of Troop 33. CLICK HERE to visit our Calendar Archives page. See what our history of activities have been over recent years (1997-2007).